Remember what you wanted what you currently have. This is my mantra of sorts lately. Even though we are not where we would ultimately like to be as a family—(student) debt free, in a house, maybe a newer car, etc—we have made strides in reaching those milestones over the last 5 years. I never want to forget about where we once were. There were so many difficult west-coast-living evenings when I'd tear up on the couch because no matter what we did to our budget or where we'd cut corners, we were still living paycheck-to-paycheck, no promise of that ever changing in the near future. And, of course, that meant we had no idea when we'd get to see our families and friends, let alone move out of state. It. was. hard. Isolated with a newborn only exacerbated the situation and stretched us what felt like beyond our physical and mental limits. 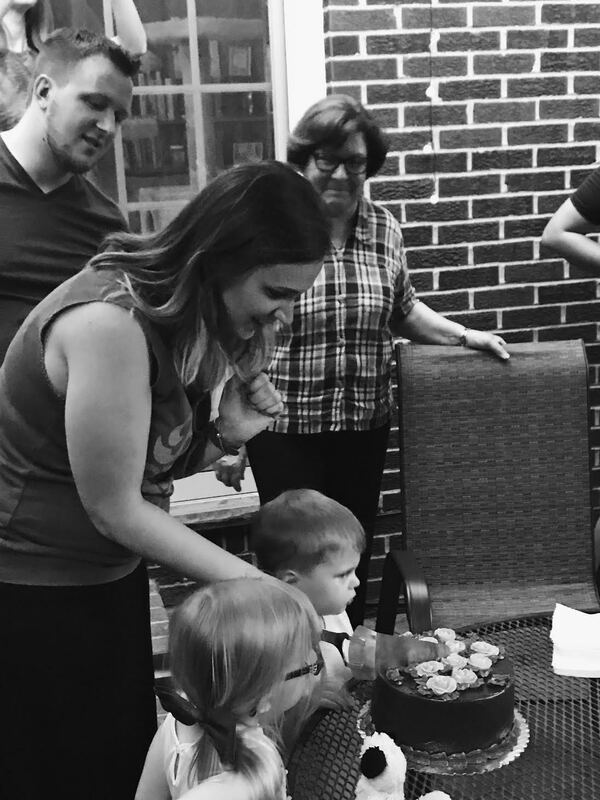 This past weekend, a few of us gathered to find out if Lochner Resident Number 5 was going to be a boy or a girl. As I've mentioned to anyone I've talked to in the past 8 weeks, I felt weird about it. It felt so unbelievably strange to buy a gender reveal party cake for our third kid when we could barely afford our $60 dollar Graco stroller for Ella. It felt so weird that I almost bailed and said "let's not do it, it's not a big deal". But our loved ones proved to be the best on the planet when they insist we celebrate. It wasn't a big gathering. I contemplated for a hot minute renting out a pavilion at a park and inviting everyone we know, but I soon realized we didn't have the time or resources to make that happen. So alas, on a hot and humid Saturday evening, the people Tim, the kids and I see most crowded around my best friend's patio table and cut open the gender reveal party cake. Simple. Relaxed. Perfect. They even surprised me with the stroller I had been eyeing—the dreamiest present this 4.5-year-and-counting-budgeting mama could have asked for. I can't wait for the day to come when my closest friends start having babies so I can spoil them. They've done nothing but make sure I've felt seen and loved ever since I started having kids, even when we were out west without help. Every night (well, most nights, we're not perfect) Tim and I sit down and say our rosary and one of my intentions is in thanksgiving for our support system. I truly don't take it for granted and I aim to, on a daily basis, remember that I currently have so much of what I wanted.